Provides “Today’s” & “Yesterday’s” Views & Visits as well as “This Month’s” & “Last Month’s” Views & Visits. 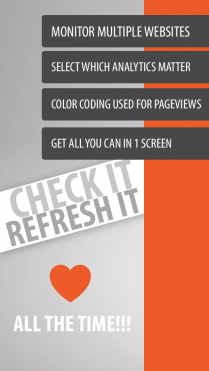 When your site’s “Today’s” Views exceed “Yesterday’s” Views the Cell color becomes Green, else the Cell remains Red! Same happens if This Month’s Views exceed Last Month’s Views. Does this Matter? Well, it does. Let us say you are a Blogger. By monitoring today’s TOP Referrals & Keywords you can find out whether someone wrote something NEW about you today. By monitoring Keywords you can find out whether something you wrote recently has made a significant change in the way people search and found out about you via Search Engines. Same goal as for Today’s Referrals & Keywords (above), but you get the bigger picture on what has been happening the last 5 days. 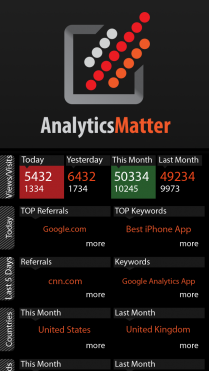 As Google Analytics, very nicely explains: Our AnalyticsMatter report lets you observe traffic levels from expected sources, but also lets you see whether there are unexpected sources, such as a product review or news story that you didn’t know about, or a popular blogger who discovered your site. If you care about Exports “TOP 20 Countries” is a very important Metric to monitor. Let us assume that you have just taken part at an exhibition, in London. Has the exhibition been a success? Well, if This Month’s TOP Country is the United Kingdom, then you have certainly achieved to approach and convince your future clients to Visit Your Website! Let us assume now something else: let’s say you notice that the #2 TOP Country is Russia. You need to question yourself. Would Russia be a possible target audience which I have not yet explored or taken advantage of? What drives traffic to your website? What doesn’t drive traffic to your website? It is important for you to know such insights, in order to make better assumptions on what works and what does now work. If you own or manage a newly published website, then you most probably need to make some assumptions on which keywords would drive traffic to your website. Are those assumptions correct? 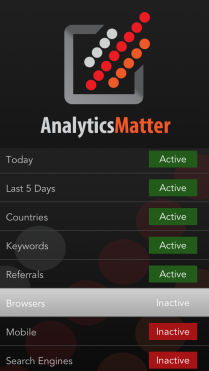 This AnalyticsMatter feature helps you understand. Which other websites drive traffic to your Website? “TOP 20 Referrals” is a very important metric – piece of information and knowledge! For example, someone new may have written an article about you – and you are not aware of that. However you notice unexpected traffic from a referral which you are not aware of. Check the referral out! Whether it is good news or bad news, you need to know! Let us take another example. Let’s say you have been advertising on 2 or 3 news portals. 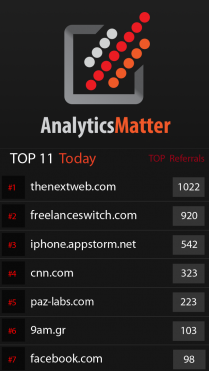 By reviewing your Referral AnalyticsMatter feature you will be provided with more information on which of those 3 news portals drives the most traffic to your website! Finally, if you discover that a known referral source climbs to a higher (or lower) referral position than last month, this is information that may warn you to do something about it. Do not take it for granted that most of your Visitors will be using Google ♥ Chrome or Firefox or Safari. There are some industries in some countries that most users browse with Internet Explorer. How does your website look in Internet Explorer and other browsers popular to your visitors? Have you ever checked? You need to know whether the number of non-PC / non-Mac visitors who access your website use a Mobile Device or a Tablet. 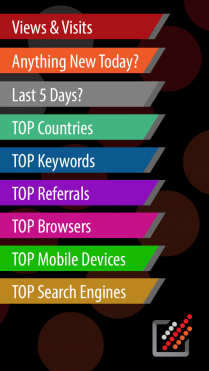 For example let’s say you have 2,000 visitors this month that accessed your website via iPhone. Does this analytic matter and WHY? Have you ever seen how your website looks when browsed from an iPhone? Should you consider creating an iPhone (or SmartPhone) version of your website which has a different IA (Information Architecture) which designed and focusing on all those users? Yes, OK; we all LOVE Google (especially our team), however this is not the only Search Engine out there in the World :). There is Bing (Microsoft) and there are hundreds others to keep an eye on. Maybe you are in an Industry or a Country that Google is not the leading search engine, or even if it is, there is another search engine right below Google which brings a lot of traffic to your Website. Our TOP 20 Search Engines feature demonstrates an issue that you need to be aware of and act act accordingly.